Deutsche Elektronische Musik: Experimental German Rock and Electronic Musik 1972-83 is back, remastered, and ready for retail. 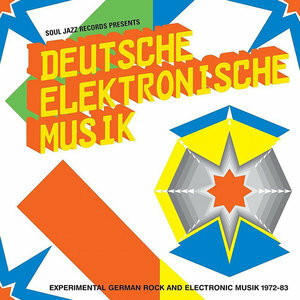 In 2010, the Soul Jazz record label had the superb idea of compiling and releasing a two-disc introduction to Krautrock's heyday titled Deutsche Elektronische Musik: Experimental German Rock and Electronic Musik 1972-83. Seeing how an artist needs to be ragingly popular to turn a profit in the music market these days, the initial Deutsche Elektronische compilation soon fell out of print after the release of two sequel compilations. The Soul Jazz of 2018 looks to rectify this situation by remastering the collection that started it all. They even left the original cover art intact, looking like something that was generated by your cool neighbor's Apple IIGS. If you are unfamiliar with names like Can, Cluster, Neu!, Tangerine Dream, and Popol Vuh, then explaining Krautrock to you could be a little tricky. Imagine an experimental form of rock music that integrates elements of free jazz, electronic music, ambient sounds, acoustic sounds, and the classical avant-garde, and yet manages to sound like none of the above when they are all combined. Throw in some drugs and a healthy dose of European anti-establishmentism (growing up in the shadow of Nazi Germany couldn't have been good for everyone's sense of trust), and you had yourself a whole new musical movement to rival the fading memory of America's Summer of Love. German rock may not have found its way into every Western household at the time, but its influence is still being felt today. If you take just a quick peek at Bandcamp.com, you'll notice that electronic music and post-rock are being created in nearly every corner of our globe. Radiohead were able to reinvent themselves thanks to the trail blazed by Krautrock. So even if names like Moebius and Roedelius are new to you, I can guarantee you that you've felt their ripple effects. I don't envy anyone who has the job of distilling 11 years of great music down to two hours. As is the case with many highly specialized genres, I'm sure Krautrock has many devoted fans sitting at the keyboards, waiting to pounce with complaints such as "They left off this?!" or "How could they ignore that album?!" and so on. But if the intent of a compilation is to spurn someone's curiosity to seek out a whole genre rather than try to encompass it, then Deutsche Elektronische Musik does the trick nicely. If we were looking at a truly comprehensive boxset here, then the listener wouldn't feel any motivation to further seek out Krautrock's hidden caves or dark corners. If Deutsche Elektronische Musik was just the best of the best and nothing else, then the customer would stop there. But as it is, one is left thinking "hey, show me more". Thus, diversity is key. Between's "Devotion" sounds like a hippie chant while Harmonia's "Dino" rides the minimalist rock bullet train for all it's worth. Faust are eerily ominous on "It's a Rainy Day, Sunshine Girl", but Tangerine Dream sound like they're genuinely having fun on the highly percussive "No Man's Land". Gila are even more positive on "This Morning", a ray-of-sunshine anthem that Jon Anderson could have drafted in 1968. Popol Vuh keep it closer to ambient territory on their two songs, but songs contributed by Cluster and their individual members opt for the soothingly weird. Honestly, drop the digital needle anyway, let the thing roam on random, and Deutsche Elektronische Musik: Experimental German Rock and Electronic Musik 1972-83 is still a really good collection. Upon its first release, the Guardian said that this collection was a "near-definitive guide to some of the world's most extraordinary music". I do my best to distance myself from such superlatives, but I'm not going to go through any writing gymnastics to say that the writer is wrong. This is extraordinary music. To say that it's near-definitive is a matter of hair-splitting. Any way you look at it, it's worth the time, money, and posterity.